Write and run Swift language programs in the Cloud Written by the team of developers that has helped bring the Swift language to Cloud computing, this is the definitive guide to writing and running Swift language programs for cloud environment. 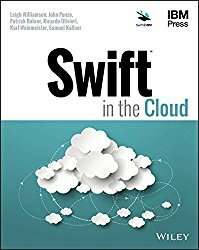 In Swift in the Cloud, you'll find full coverage of all aspects of creating and running Swift language applications in Cloud computing environments, complete with examples of real code that you can start running and experimenting with today. Since Apple introduced the Swift language in 2014, it has become one of the most rapidly adopted computer programming languages in history—and now you too can start benefitting from using the same programming language for all components of a scalable, robust business software solution. Create server applications using Swift and run them on pay-as-you-go cloud infrastructure Quickly write and test Swift code snippets in your own cloud sandbox Use Docker containers to deploy Swift applications into multiple cloud environments without having to change code Grasp the elements and structure of the Swift.org open technology project Find out how to avoid the complexities of runtime configuration by using Cloud Foundry buildpacks for Swift Build high performing web applications and REST APIs with an open source Swift based web server framework Scale up your cloud services by running Swift modules in an asynchronous, open source, 'serverless' cloud environment Whether you are already using Swift to build mobile applications or a seasoned web developer, Swift in the Cloud will help you leverage server-side Swift to power your next generation of applications.